I posted last week about a recent treasure hunting venture and the purchase of this wonderful crate. I've been trying to decide how to use it so that it's beauty can be displayed. 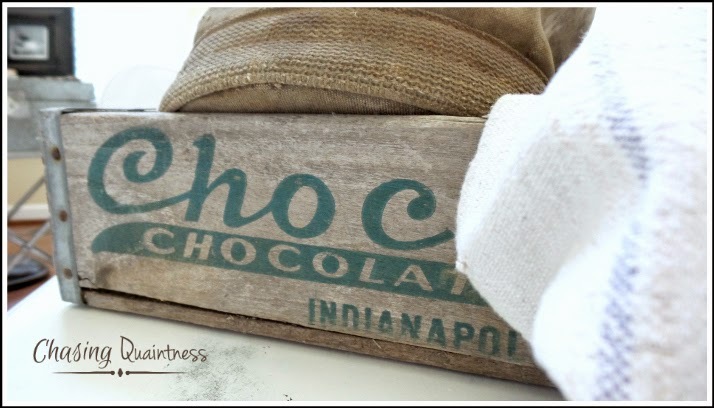 I love the patina of the wood, the logo on the side of the crate and the overall rustic condition. It had to have a spot where it could be seen and not tucked away under a table holding magazines or books. After pulling items from the kitchen for the restyle of the coffee table, the counter was left forlorn and bereft. An exaggeration, I know, but it just looked sad with tatters of decorations scattered about. I searched the floor (where most of the stuff had landed) and there was the crate. He was screaming, "pick me, pick me". So I did. I went through a few other things, made a few changes and now he proudly and beautifully sits on the kitchen island counter. This is what the area looked like before. Boring and uninspiring. I wasn't crazy about it, but needed something on this end of the counter. 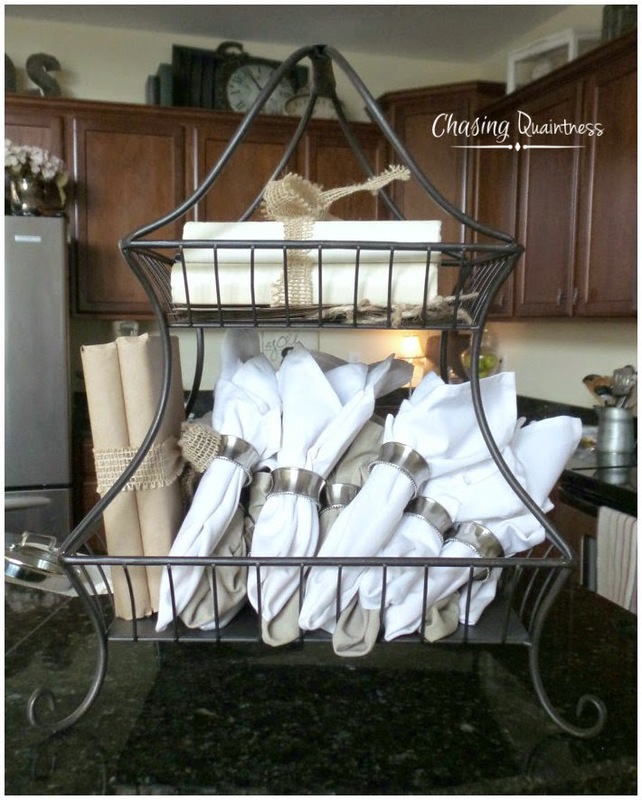 I had used this stand for a book club party I hosted in January. I've been ignoring it until I could decide how I wanted to restyle this area AND because decorating with black countertops baffles me. Because they are so dark, it is difficult for me to find the right balance of color. Now it's a done deal and I just love it! The crate is gorgeous! 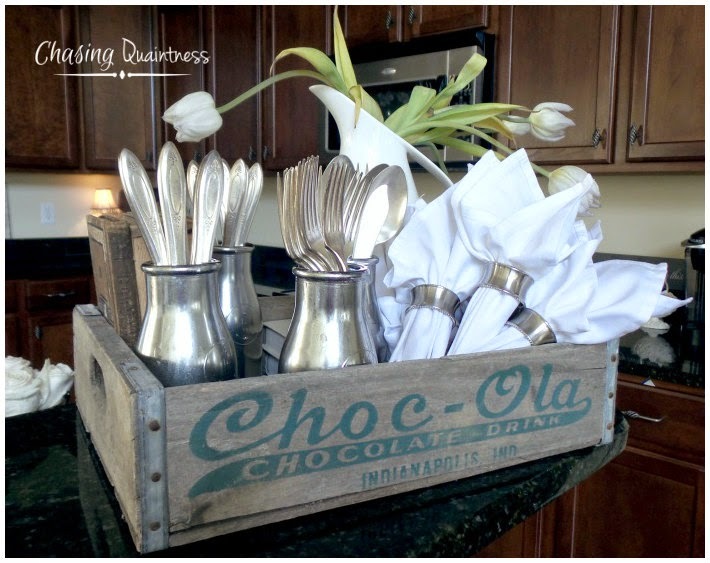 I love the rustic look of the crate paired with the silverware and white napkins. My tulips are fading fast, sort of looking like Audrey II in Little Shop of Horrors, but they will be replaced today with some beautiful pink ones. Or maybe white ones. These are sort of looking white because their lavender color has faded away. 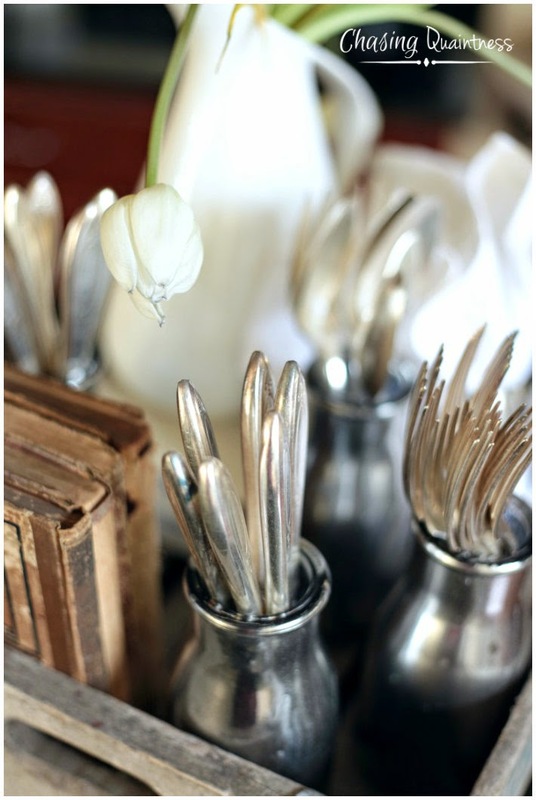 And see those little bottles the silverware is sitting in? I made those! YEP, you heard that right. I MADE them! Well, not actually the glass part, but the coloring on the glass. I did that. Not an epic craft failure this time! I'm so glad they turned out like I envisioned them. My poor bruised ego, or eyesight, could not take another failed craft project. I will show those little beauties off in my next post! shared with Seeking Lavender Lane, One More Time Events, Thoughts from Alice, Dwellings, A Tray of Bliss, Between Naps on the Porch, Karen's Up On the Hill, Savvy Southern Style, The Honeycomb Home, Purfylle, The Dedicated House, Kammy's Korner and Tatertots and Jello! Your silver brightens your black countertops very nicely. I will be back to see your gorgeous (great success!) 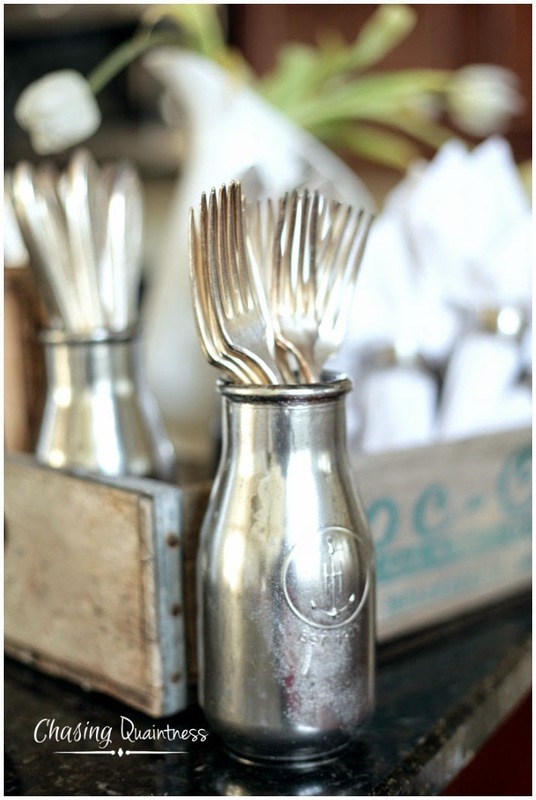 silver bottle craft project. Thank you so much! Black countertops are just difficult for me so I thought this might be a nice offset! Have a great evening! Visiting from the Link Party Palooza. Your crate is lovely and I'm crushing on your silver milk bottles! Awww, thank you so much Michelle. My post tomorrow is about how I made those little bottles! Have a great evening!! How lovely! 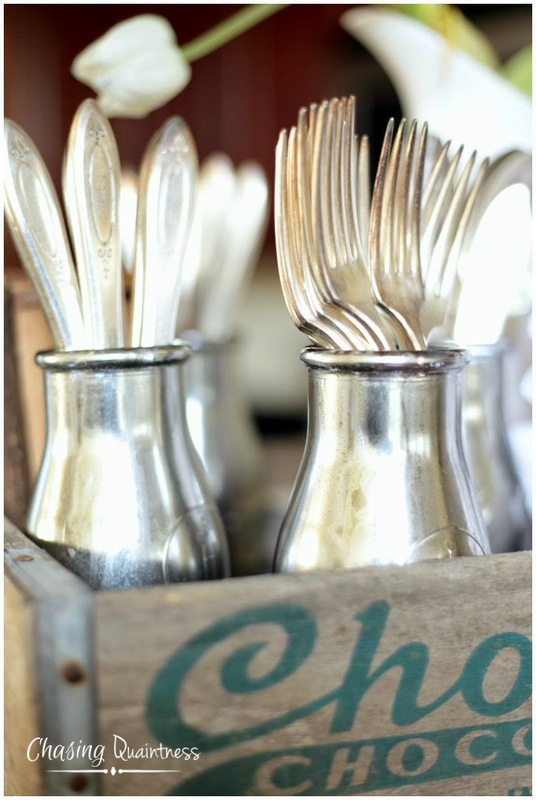 The crate is beautiful, and I LOVE the bottles you have the silverware in! Beautiful! Thank you so much Maria. I fell in love with that crate when I saw it and immediately grabbed it up to bring home! My post for Saturday is how I made those little bottles! Have a great evening! I love this display. The crate is perfect! Thank you Michelle! I like it much better than what I had sitting there! Have a great evening! "Boring and uninspiring" = "in the same place for more than two weeks"
BTW: What goes well on dark countertops? Venison, duck, and a ring of rattlesnake, for contrast. You're welcome. Thank you so much! I do hope you will visit again and thank you for your sweet words! Have a wonderful evening! I cannot tell you how much I love this! I just happen to have a crate with the Angry Orchard logo on it, so more appropriate for fall, but I have never used it. You have inspired me to do just that come autumn. Thank you so much! Thank you so much! Oh, that crate of yours will be wonderful for fall, especially with some little white pumpkins! Thank you again for visiting! Have a great evening!! Just charming! I like the look. Laura, thank you so much! It improved the look of my kitchen bar counter greatly! Have a great evening! Thank you so much Cathy! I'm please with how my little bottles turned out. Usually my craft projects are epic failures! LOL Have a great evening! It looks lovely, Benita and those little bottles turned out perfect. I thought you bought them! Thank you so much! I'm so proud of those silly little bottles...that I didn't totally screw them up....LOL. Hugs!! Thank you so much for sharing your lovely things at Something to Talk About! Karen, thank you so much! I love your link party...so many cool things to see and so many wonderful ideas! Have a great day!! Love how you've used the crate and the bottles are so pretty! I'll be looking to see how you made them. Thank you so much!! And thank you for hosting the link party each week. It is much appreciated! I appreciate greatly your featuring me this week! I'm excited!! Have a wonderful evening! Benita, I'm gaga over crates too, and I love yours, but I especially like how you painted the bottles. Visiting from Amaze Me Monday - congrats on the feature. Rita, thank you so much! I was pleased with how it turned out considering that most of my projects do not end up looking as nice. :-) Thank you again and have a great evening! The crate is fabulous! And with the silver pieces in there, it looks even better. Thank you Pam. I was pleased with this project, unlike my others…LOL. Have a great evening!! 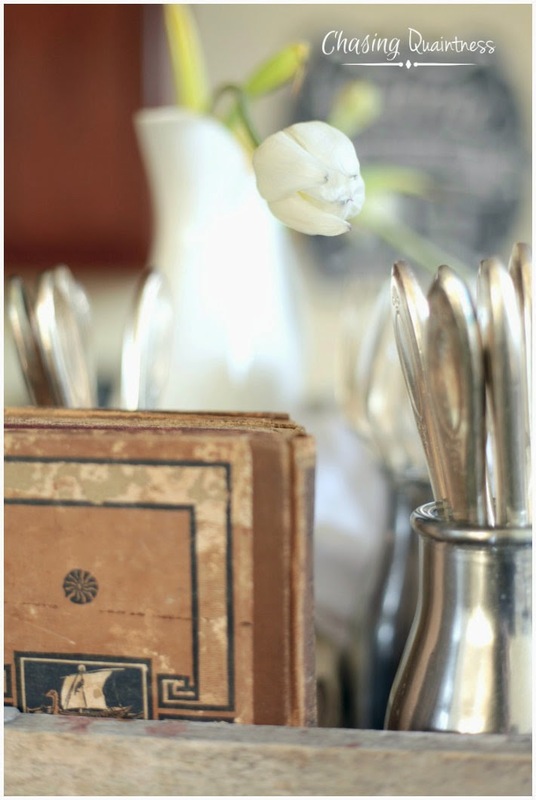 Seriously Benita, your crate has so much more charm , with the antique books, faded tulips, silverware, and those bottles! I thought you bought them at Pier 1 or Pottery Barn. What's your secret? Congrats, on the DIY that turned out and the feature! Wish me luck! I am going to try my first reverse transfer! Have a great week! Christine, thank you so much! I fell in love with the crate when I saw it and knew that I had to make it work somewhere in my decor. Those bottles were truly another one of my trial and error projects. This time, they worked out. My others craft posts are all about the failures...LOL. Good luck with that reverse transfer. I haven't been able to make one look good yet...LOL! Have a wonderful week and thank you again! Christine, thank you so much and no, I do not mind at all! I appreciate it greatly! Don’t you just love crates??!! 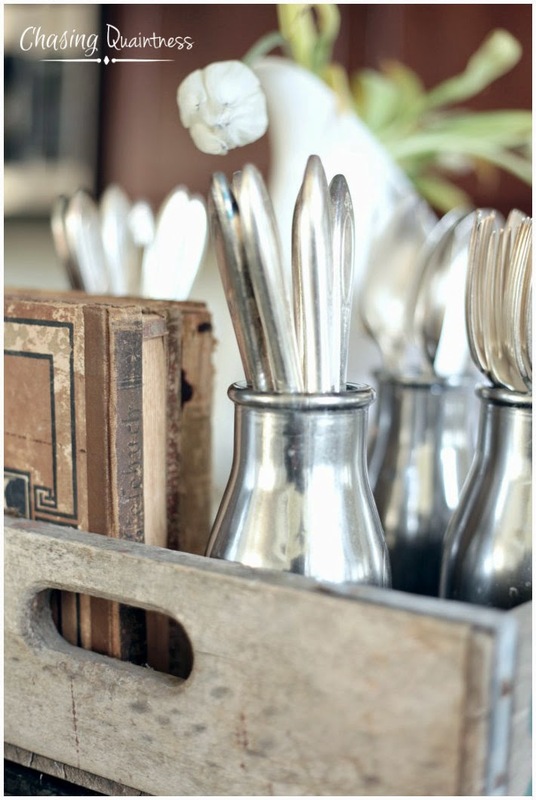 They add a little bit of texture and rustic-ness, but still look elegant! Thank you again so much and have a great evening!